Flight time for a standard single-pilot carpet from Al’Rashad to Afjarrifjord is thirty-one hours, not counting pilot rest. Experienced carpet pilots learn to bring their carpets to a halt about fifteen feet above flat, abandoned terrain and sleep on the carpet. This right here? This is where the second volume of our trilogy starts. We’re funding this (and by “this” I mean “the time that Davinder needs to be compensated for since drawing this drags him away from his actual day job of supply teaching” – Chris isn’t seeing any of it presently, he’s just the writer, writing comics is the easy bit) via our Patreon, which you can contribute to here. 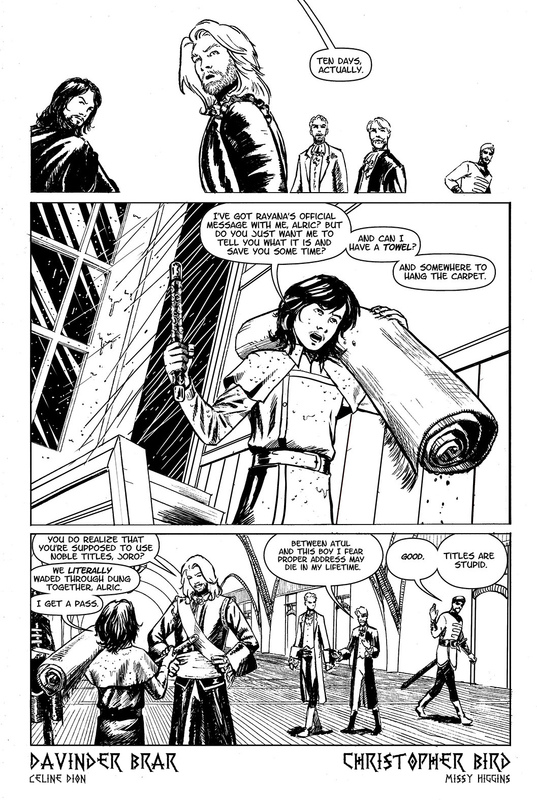 Contributors get to see pages earlier, rough pencils, occasional script pages, and all sorts of other goodies – up to and including getting cameo appearances in the comic. The success level of the Patreon also dictates how often readers get new pages. Right now we’re at only one page a month, but we’re less than fifty dollars a month way from biweekly – and our contribution scale goes all the way up to three pages every week. Which we’d love to see happen, because it would mean instead of having to tell the whole thing over the course of years, we could finish the whole story (which will be as long as Al-Rashad was – 250ish pages) in eighteen months. 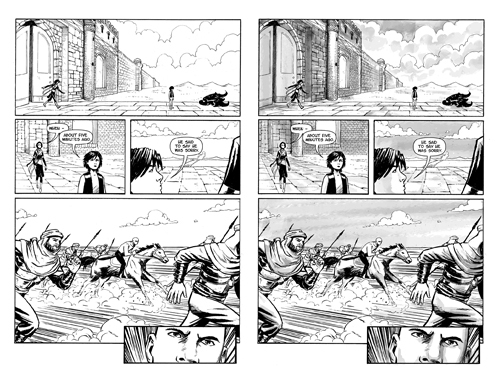 Here’s how it looks when Davinder’s doing the greywashes! The discussion’s over on MGK’s site, with another rough. 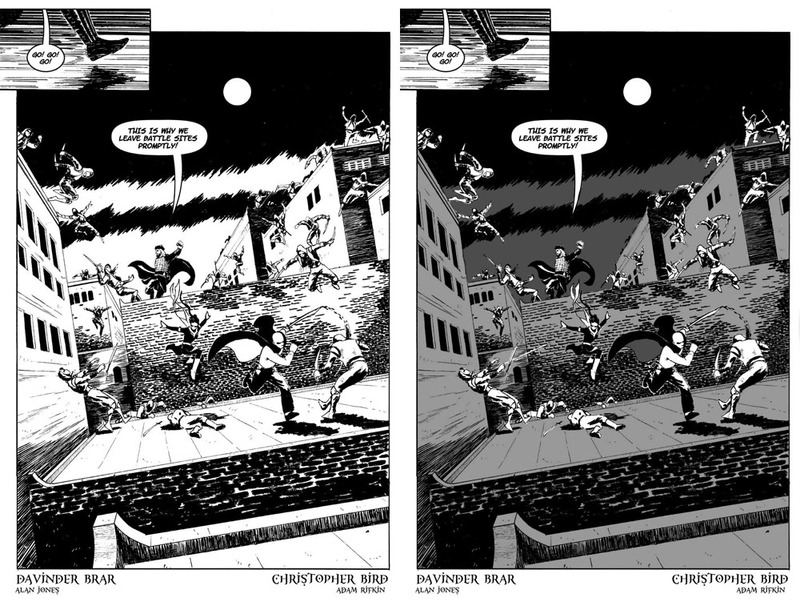 Over on his main blog, Christopher Bird asks for opinions on shading, for the collected edition. MGK did a Q&A, and he fielded a couple of questions about Al’Rashad. For those of you interested, we now have a Characters page which has… a lot of information for you! Maybe you will find it interesting. Maybe you will not.